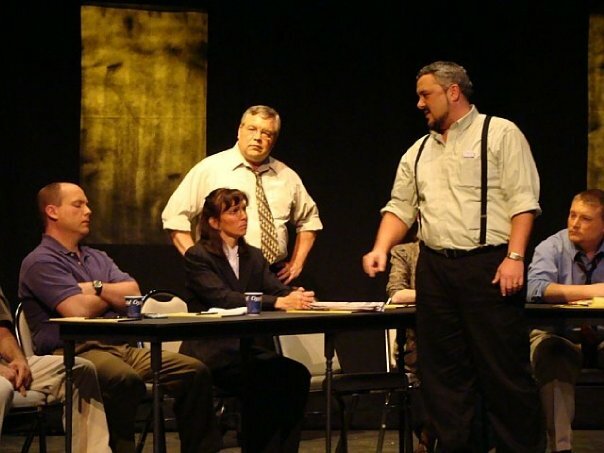 David as Juror #7 in “12 Angry Men and Women“, a Cascade Community Theatre Production. Recently I was invited out to lunch by a good friend. We opted to pass on the usual places and instead ended up meeting at the local Chipotle’s. It had been awhile since we had the opportunity to meet up for lunch and talk about the big changes that have been going on in our lives, so I was looking forward to it. It was packed inside, so we opted to take our food outside and brave the elements. The winds were really blowing but the weather afforded us a bit of privacy. In one of those rare moments for us as men, we soon found ourselves in the midst of a deep, honest and authentic discussion. I should point out that I have tremendous respect (and empathy) for Mike, as I know only a little of his story and what he’s had to persevere over the last year or so and what I know is more than enough for him to have earned my admiration. I wish that I could say that I would have responded as appropriately as Mike did, if I found myself in the same situation, but that would be a lie. This guy has an amazing unflinching desire to respond to others, even misguided individuals spreading lies about him, in a loving, grace-filled manner. He puts me to shame in that category. As our conversation continued, he inquired about all the changes in my life, since my return from Mwanza, Tanzania. I told him that I was invited to go to India in January, which I was excited about. Eventually, we got around to discussing how I felt about the H2O Discussion Group that I had been facilitating, had gone. Given the tenor of the discussion, I responded honestly, sharing the good things I saw and experienced, as well as the parts which as a teacher/facilitator make you a little sadden by. If you are a teacher, then you already know well, what I am speaking about, so there’s no need to rehash that now. Suffice it to say, Mike nodded understanding my position, but challenged me to look at in a different way. He then looked me in the eyes and shared something honest and personal with me, which in the world of men is unusual and rare but something that most of us have been missing for too long. It made me realize and appreciate the fact that our occasional lunches together had formed the foundation of a strong friendship, one that permitted us to be a bit more honest and upfront with each other than other relationships, without the risk of being condemned for it or written off. David as Player 1 in “Ophelia Thinks Harder“. Cascade Community Theatre Production. He told me that throughout the day, when people come to his mind, he makes it a practice to write out a prayer for then and record thoughts and insights that come to him at the time. He mentioned that earlier in the week, I had been on his mind and that he had written out a page of thoughts/reflections about me. I must have looked at him funny, as he quickly added that if I was interested, he would email me the notes. Honestly, it did make me crack a smile because that is something that men, even if we did it, would be unlikely to ever share that information with the other person. I told him that would be cool, but I would be interested to hear the abbreviated version now. He then said something that I have been thinking about for over a week now. He made an observation about me which I had never thought of before in those terms, but even as he spoke the words, I could not deny that it was a valid observation. I am paraphrasing from memory here, so this is not a word by word direct dictation. He told me that whenever I am put in charge of something, like being asked to be the Commander at Awana or asked to teach/facilitate a class or even to speak on a Sunday morning that I always rose to the challenge, went above and beyond what was expected of me and did an excellent job. Contrary to how I might have actually felt at the time, people perceived me as confident, committed and very comfortable with being up front and in charge. 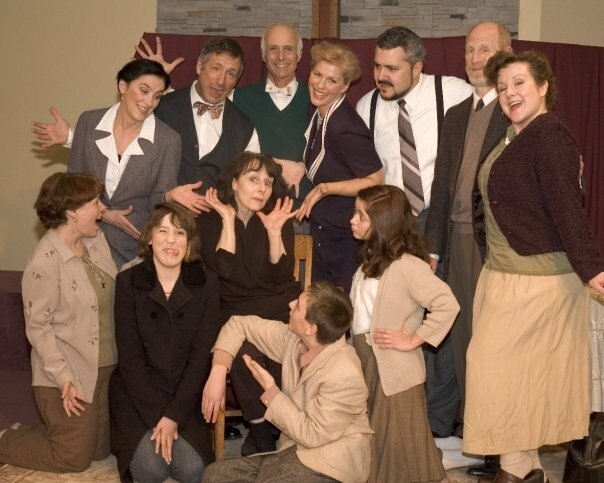 David as Hermann van Daan in “The Diary of Anne Frank” an Evergreen Family Theatre Production. I squirmed uneasy in my seat as I have yet to learn how to receive a compliment from someone. My default response to a compliment is to become uncomfortable and then try to talk them out it, when I should just say, ‘Thank you’ and leave it at that. Before I could start to do that, Mike followed up with another observation. He said that he noticed that when I am asked to serve at an event, which I am not in charge of, that I also respond in a similar manner. Going above and beyond and doing so in a manner which others perceive me as being extremely confident and completely at ease with; regardless of how much I stress over what I am doing. I thought about the many years of cooking the Men’s Breakfast on the first Saturday of each month and other times when called upon to server behind the scenes, cooking and serving food for others and coming around picking up dishes off the table and washing them. So far, that all sounded pretty good, but I could tell that Mike was leading up to something. He said the one area where you don’t appear at ease or comfortable is when you just are hanging out as part of the group, like at Men’s Breakfast when you are not cooking or speaking. I’ve been thinking about that for a while now. He’s absolutely right, but why is that the case? In my meditations upon our conversation later in the week, I found myself considering the line from the play “As You Like It” by William Shakespeare which speaks to idea that we are all actors, playing our parts on the stage of life. I thought about this in context to Mike’s statement. Could it be that I am only comfortable when I have an active role to play, but am ill-at-ease when I do not have an active role to play? 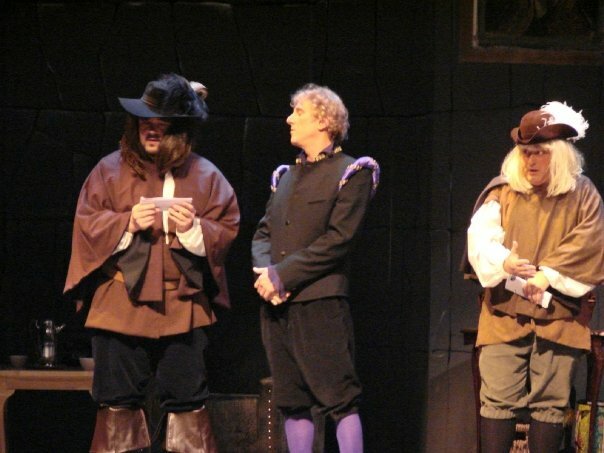 It makes a certain amount of sense, as in my limited time onstage at several local community theater productions, the most challenging times on stage tend to be the ones when your character is not speaking or performing a task. Art imitates life, they say therefore it should be no surprise that I would be ill-at-ease when not having an active role to play in life. I wonder if others have ever considered this before or noticed anything similar in their own lives. If so, I would encourage you to share this with me. I wonder how this all plays into the connection that we are given to make about our personal worth being frequently associated with the roles which we play out in life. How many of us assess our own selfworth based on the prestige the world hold regarding our job? Isn’t that one of the first things that men do when meeting for the first time? “So, what do you do for a living?” It’s also one of the reason’s which I try to avoid asking that question of someone else, which I have just met. Our worth should not be established solely based on the work which we do or the position we hold within our place of work. In the kingdom, I am beginning to re-learn that our value or self-worth does not fluctuate based on the opinions of others or even ourselves for that matter. Regardless of whether we are praised or held in high esteem for some of the roles that play, our true value is unalterable. It is so, because it’s based on the worth that God ascribes to us. He sees each person as precious without distinction based on their level of busyness, the size of their 401K plan or the numbers on their paycheck or whether or not they receive a paycheck at all. Perhaps in keeping this in mind, I can become a little less uncomfortable hanging out with others without having to do something other than just be present with them. If my anxiety stems from subconscious insecurities and the feeling that I need to continually prove to my worth to others by always doing things, then I need to release that; let it go, as it can’t be spiritually healthy. If I gain any additional insight into this, I will share online. I think you’re onto something here. As a SAHM, the conversation usually ended when I shared my career choice if I was at one of my husband’s work events; now that he is retired, he has occasionally felt the need to defend his choice to not work because so many expect you to be a paid worker until the day you die (lest you have no identity at all). Each another’s audience outside the gilded cage. We all need to remember where our worth comes from; it doesn’t have anything to do with our careers or volunteering. We are, each of us, valuable simply because God created us, and we are so very valued that He chose to die for us, to save us. We need to rest in that knowledge. And we need to grace one another by seeing each other through God’s eyes. Shakespeare and Rush were great observers of what was happening all around them, but we don’t have to give into the cultural norms. I’m glad you have Mike to give you honest feedback and friendship. Thanks, Karen. It’s been even longer now and I still think about the comments Mike made. The danger now is that I am somewhat obsessive at times and as I re-hash this over and over again, I wonder if I am embracing it as who I am. I mean, the danger is that I stop pushing myself to be in situations where I am just one of the guys and less comfortable than when I am in charge or am serving behind the scenes. Do I just accept that I am wired this way or do I push myself to be in situations where I am less comffortable and just be one of the guys?